Located in the very city center of the capital of Bulgaria, Sofia Guesthouse offers secure, clean and affordable accommodation in newly renovated 4, 6 and 8 bed rooms. For a total of 9 euro per night including all you can eat breakfast, you will be able to enjoy free linen, hot showers/toilets, fully equipped kitchen, free internet access as well as wide screen TV sets with cable TV. Laundry and ironing facilities, safe secure storage in over 50 lockers at guests' disposal will quarantee you a comfortable stay while our friendly hosts will assist you by arranging exciting one day trips, mountain treks, bicycle and car rental and a lot more. Apart from its top location the hostel offers a nice garden for relaxation. Sofia Guesthouse is also just 350 m from the most famous meeting point in Sofia - the monument of Patriarch Evtimiy (conditionally named "Popa" in Bulgarian). Plovdiv Guesthouse is run by Penguin Travel. Over the past 15 years Penguin Travel has specialized in providing quality products in the f.i.t. travel area in Bulgaria and a number of other countries including Russia, Spain, Portugal, Denmark, China, Mongolia, Iran and more. In particular active tourism and the exploration of not so known areas on the borders of the well-known tourist destinations is our speciality. Trekking, birdwatching, sightseeing, cycling, horseriding and on request any other trips could be organized with the quality assured by our in depth local experience. Our staff at our offices in Denmark, Sweden, Russia, Bulgaria & Mongolia accompanied by a wide network of experienced suppliers will ensure the quality, safety, good value and cost-effectiveness of your tour programmes. Beijing is a never ending Dream!! A brand new modern and intense hostel opened 8th July 2009 in Beijing Are you looking for a nice and peaceful place to stay, far from the party with drunk people? If so ,This is your hostel!! You'll have a nice time here and enjoy the city. In this hostel we wont allow drunk or disrespectful people who disturb the rest of the guests. A Home Away From Home A homelike accommodation for travelers At very affordable prices for individuals, family or groups Best area in downtown Taipei and less air pollution. It's easy from and to international airport. ** From International airport, take Evergreen Airport Bus to Taipei city Get off at Songjiang Hsintsun (12th stop.) Taipei House is beside the stop. Bus frequency :every 20 min. From 5:20 am ~ 02:30 am **Buses go to international airport can be taken at downstairs of our building. Rossi Hostel is the perfect place to stay for an unforgettable trip to Sofia. We are centrally located, close to the Central Railway Station, but the area is peaceful with lots of fresh air! There is lots of places to go walking.Your accommodation in this luxury hostel will be very pleasant and comfortable. The rooms are very clean and bright, they have new beds and the decor is modern and fashionable. So we feel sure that you will be happy to come back here. 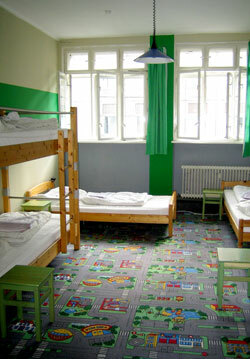 The hostel has capacity for 10 people and has 2 balconies, 2 bathrooms and 2 WCs.